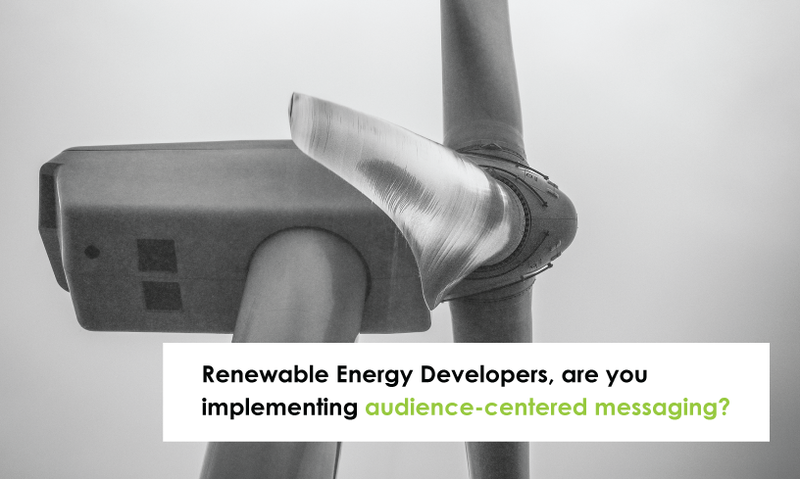 Are Renewable Energy Developers Content (adjective) With Their Content (noun)? By nature, land use permits and sustainable infrastructure projects are social endeavors. They require participation, interaction, and conversation. To get that engagement started on the right foot, we must establish a baseline of content that is meaningful to our potential audiences. Luckily, the secret to creating high-quality content is simpler than most organizations think: Just start asking questions; What is it that we are offering? ; How will people benefit? ; Why is this project a good thing to support? ; etc. That may sound simple — and in a sense, it is — but we’ll get to the challenging part soon. Here’s what you need to know to build content that gets people talking: Great content strategies invert traditional marketing roles. Say you want to convince local landowners that a proposed solar farm will benefit the community. You’re passionate, and you’ve got a strong message. But you can’t launch into full-on promotion mode and hope to win hearts and minds on the strength of your argument alone. Of course you’ll promote your message vigorously, but you have to simultaneously build trust. Trust is at the center of a strong content strategy, right there next to authority. It’s not what you want to tell your audience that’s important, it’s what they want to know. Sure, a 200 Megawatt network of wind towers can offer impressive, clean energy output. And, as a developer, you’re certainly positioned as an authority, but is this really the value the community will care about and embrace? For starters, focus on successful track records elsewhere. Have schools been revitalized as a result of new tax revenue from a solar energy project? Have deteriorated roads finally had a shot at being repaired because a wind farm is now up and running? Were drainage tiles throughout acres of farmland identified and repaired on behalf of fulfilling a promise made to your landowners? Relating questions like these to your project’s footprint just may help you better prepare your narrative for garnering your audience’s attention and support, and most importantly, their trust. Successful content marketing starts with understanding your audience’s needs. Search engine giant, Google states this as their first basic principle for webmasters: “Make pages primarily for users, not for search engines.” Same goes for your project or brand’s mission. Develop content with everyday people in mind — avoid words geared for mechanical engineers or savvy investment bankers. Start by trying to anticipate the questions your audience might ask and who in that audience may be asking them. If you can do that, your content will align easier, and with more influence. Notice that I state “more easily.” You still need your content to be clear, authentic, accurate, and engaging. This is one way firms like KAOH Media can really help out. The grassroots public affairs question/answer framework is very similar to SEO (Search Engine Optimization). There’s a reason that search terms are called “queries.” What do search engines strive to provide but the best possible answers to any given question? Will my audience appreciate my content? Think of a time you were frustrated, but someone came along with just the help you needed. Remember that sense of gratitude? That’s what you want to create for your audience. Provide relief and peace of mind whenever possible. Does my pitch position my brand as an authority? Present what you know. Stick to experiences and facts. Don’t try to reach your audience through subjects unrelated to your core mission. They’ll see right through you. And keep in mind, the best defense is a good offense. Is my message clear, consistent, and easy to understand? Analysis by web consultant Jakob Nielsen long ago revealed that users are likely to read just about 20 percent of any given web page. At most, they read 28 percent. Text must be as easy on the reader as possible. Be considerate of text size, fonts utilized, length of scripts, and their placements for optimal visibility. Am I publishing regularly — and if not, do I need to bring in an expert? Consistency is a hallmark of authority. Readers are less likely to trust sites and/or social media channels that fail to post regularly, with dependable quality. If you need help keeping your copy plan on track, KAOH Media is here to help. An authentic marketing and public affairs strategy has a lot in common with the fundamentals of SEO. Every piece of content should be designed to provide a service to your audience — precisely the information they need to make informed decisions, whether they find you through search, social, or serendipity. The right words and visuals can change everything when the speaker starts by listening. It’s kind of cool, when you think about it, this audience-centered messaging. And it’s not just cool — it’s effective. Remember, content doesn’t just mean blogs and Facebook posts. Content refers to everything in your public portfolio — not just the written word. When answering questions, you’ll also have to consider what your audience wants to see, hear, and share. Consider videos, podcasts, print advertising, direct mail, live events, or something else entirely. It’s important to layer and deliver your message using several mediums. In a marketing context, the chosen medium doesn’t matter as long as the offering furthers your goals. Whether you serve your audience a moving documentary film or a well-timed tweet, the important thing is to build support through established trust. Content pertains to a wide spectrum of things, sure. But good content is only that which benefits the audience. High-quality content builds your brand’s presence, peaks engagement, educates visitors, and establishes your organization as a trusted authority in its field. Don’t be content with anything less.